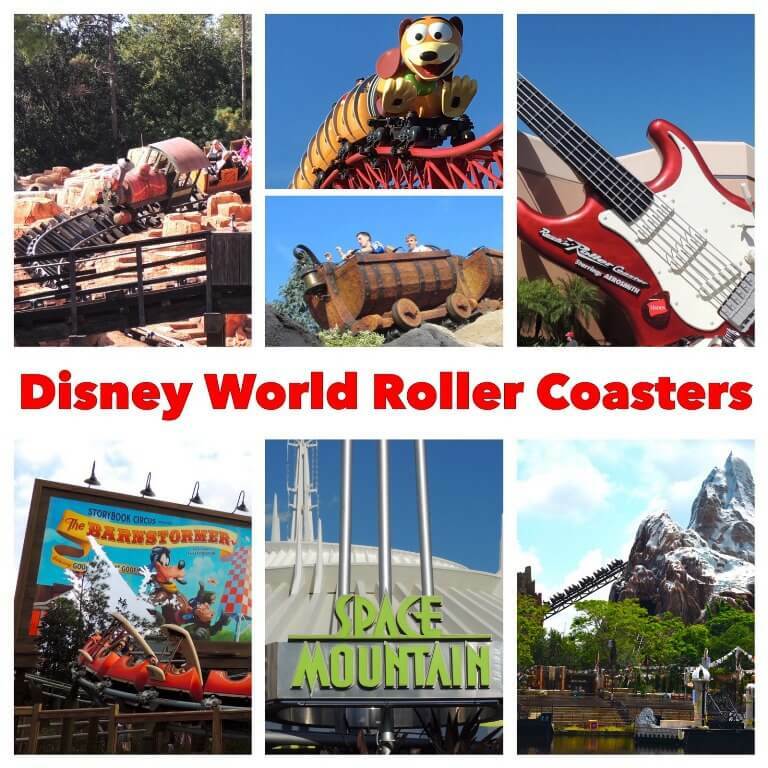 Disney World Roller Coasters from least to most intense; includes Big Thunder Mountain Railroad, The Barnstormer, Expedition Everest, Rock ‘n Roller Coaster, Seven Dwarfs Mine Train, Slinky Dog Dash, and Space Mountain. Are you wondering about the intensity of the Walt Disney World Roller Coasters? We’ve listed them here to help you decide which ones you are ready to tackle. The Barnstormer – Magic Kingdom: This is a kiddie coaster not that different than you would find at any carnival though it is a bit higher off the ground and may be a little faster. The drops are pretty mild. The whole ride only takes about 53-second and it just makes me giggle. Must be 35-inches or taller to ride. Slinky Dog Dash – Disney’s Hollywood Studios: This is a good introduction to big-kid coasters. There are no inversions or cork screws but it does zip right along and the drops are more intense than Barnstormer. I think it is more fun at night. Slinky Dog Dash is currently the most popular ride at Disney’s Hollywood Studios, in part because it is new, but also because it is fun. Two of our agents are not thrill ride people at all and they skip this one. This is currently hardest FastPass to acquire at Disney’s Hollywood Studios; click here for tips for riding without waiting hours in line if you weren’t able to get a FastPass. Must be at least 38-inches to ride. Seven Dwarfs Mine Train – Magic Kingdom: There is some debate about whether this is more or less intense than Slinky Dog Dash; they’re close, but I rated it after Slinky Dog because the cars have a bit of a swinging quality that causes me some slight nausea. Very cute ride and the Memory Maker / PhotoPass video for this attraction is so adorable. Even though it is the newest ride at Magic Kingdom, it has an old-fashioned feel in keeping with the Snow White theme. Hardest FastPass to acquire at Magic Kingdom, partly due to its being new but also because of its broad appeal. Must be at least 38-inches to ride. Big Thunder Railroad – Magic Kingdom: This is my personal favorite Disney coaster because it is fun though it is definitely a step up in intensity from the previous two coasters. The setting is so well themed! You don’t go upside down but you do go fairly fast and it will slide you into your co-rider too. I ride it over and over and over again – especially after dark. This one is where we really start to separate the non-coaster people from coaster people. Thrill seekers will find it somewhat tame but others will find it too intense; this goldilocks thinks it is just right! Must be at least 40-inches to ride, children age 7 or younger must ride with an adult. Space Mountain – Magic Kingdom: This is where you cross the rubicon into definite thrill rides. Honestly, you don’t go that fast or upside down but Space Mountain is intense because you’re riding in a fairly dark space so you can’t always see the drops and turns ahead of you. Definitely a big step up in intensity from Big Thunder Mountain. This one causes me some nausea sometimes and I haven’t narrowed it down to whether it is when I sit in a particular location in the car or something else. Definitely more jarring than the previous coasters, something to think about if you have back or neck issues. Must be at least 44-inches to ride, children age 7 or younger must ride with an adult. Expedition Everest – Animal Kingdom: This ride doesn’t go upside down but there is a backwards corkscrew in a dark section that makes some people feel like they’re going upside down. Very well themed and genuinely fun but you are definitely entering the big leagues. Not as intense as many of the coasters you find at thrill parks like Six Flags; it is still designed to excite rather than terrify you but many people will be terrified anyway. I like riding this one both during the day and after dark. I can ride two times in a row without nausea but am going to feel sick if I ride it three times. Top speed of about 50 mph. Must be at least 44-inches to ride, children age 7 or younger must ride with an adult. Rock ‘n Roller Coaster – Disney’s Hollywood Studios: The most intense coaster at Disney World and this one will take you through loops, corkscrews, and drops that makes it very clear that you are on a serious coaster. You’ll go from zero to 57 mph in less than 3-seconds and you’ll be pulling 5 g’s when you enter the first loop. The Aerosmith soundtrack adds to the intensity and it is fast and thrilling. This one is probably my outer limit of roller coasters and once per visit is enough for me. When I was being diagnosed with a minor heart condition, my cardiologist gave me permission to ride any coaster I had ridden before but my family vetoed that and would not let me ride this one though they let me ride all of the others. My thrill seeker children love this one but my anxious daughter has decided to never ride it again. Must be at least 48-inches to ride, children age 7 or younger must ride with an adult. FastPasses and Theme Park Touring Plans: As you can imagine, the Disney World roller coasters are very popular and can draw long lines but Disney’s FastPass system and good theme park touring plans can help you keep those lines at a minimum. Click here to learn about theme park touring plans.